This soup is a wonderful tasty winter warmer that is low in calories and perfect as a main meal when served with crusty bread. You might like to add an optional tin of kidney or butter beans to provide a kick of protein. 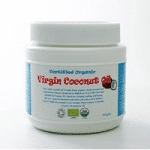 The coconut oil provides a mild sweet flavour. Sprinkling of salt and black pepper. Add the coconut oil to a large pan and let it melt into liquid form. Chop the onion and add to the pan. Chop or crush the garlic and add to the pan. Wash and peel the carrots (if non organic). Chop into circles and add to the pan. Add the organic vegetable stock cubes. Alternatively, add a large sprinkling of sea salt. Bring to the boil and leave to simmer for thirty minutes. The ingredients will now be soft and ready for blending. 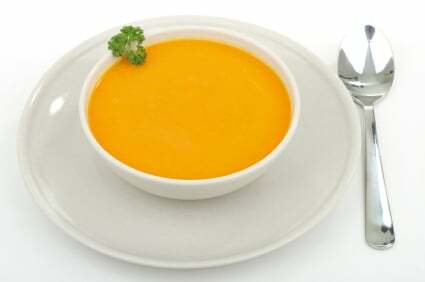 Add two ladles of soup to a blender with a little liquid and then transfer the soup to a bowl. Continue until all ingredients are blended. Chop the fresh coriander and add to the soup. Add fresh black pepper. Wash and add the tin of beans (optional). Serve with fresh crusty bread and butter. If you want the soup to have a kick, you might want to try adding a red chilli. There is also an option to add celery and red pepper for a tasty meal. Practice makes perfect when making this delicious carrot and coriander soup.